Inside one of the major tombs with the sun low in the sky. Photos by Joel Simpson. Our driver cooked us lunch while we explored the area, and we all sat down for a picnic – with hot food! That’s me on the far left. 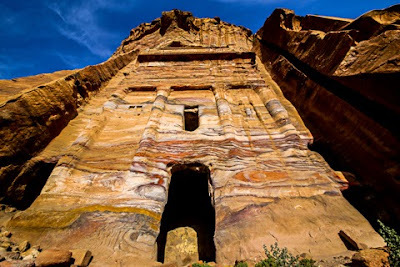 One of the major tombs in the central part of Petra, overlooking the main thoroughfare. FOREIGNERS might want to avoid the Middle East, since so much lethal conflict is going on there. 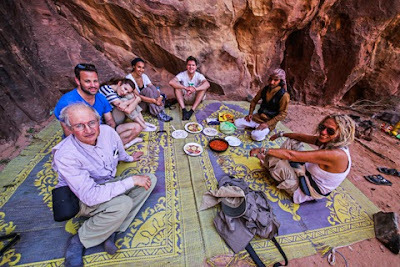 But the friendly little Bedouin kingdom of Jordan is an island of stability and welcoming smiles, with a number of world-class attractions to recommend it. In the Bedouin Lifestyle Camp guests sleep in comfortable permanent tents and walk to a common bathroom. 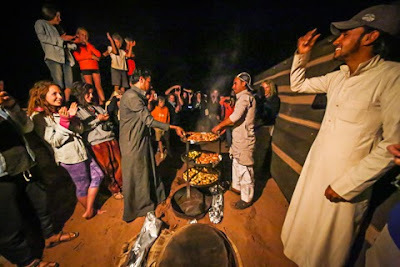 Everyone eats in a communal tent, where dinner is cooked underground and dug up with great ceremony, then served buffet style, accompanied by music and dancing. 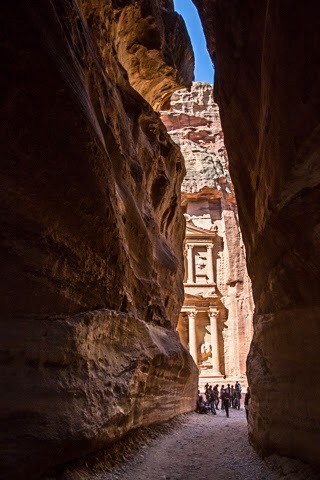 The famous view of the Treasury, carved in sandstone, as one emerges from the narrow defile leading to Petra. Remember this façade from the movie "Indiana Jones and the Last Crusade"? The following day we are speeding around the desert in a covered 4x4. During the roadtrip we call on petroglyphs, T. E. Lawrence’s wall, a shop under a tent and two natural arches. “Snowboarding ” on a sand dune is much, too. 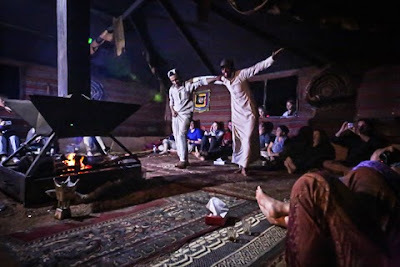 In the communal tent at the Bedouin Lifestyle Camp, music and dancing precedes dinner. The city acquired wealth as the crossroads of two major trade routes – North-South and East-West. Petra suffered a powerful earthquake in 363 CE, which disrupted its water supply. In another 200 years it would be forgotten. Walk down a mile-long canyon called the Siq – the main entryway to Petra – and be lead to a view of the Treasury. It is one of the city's most famous ruins. 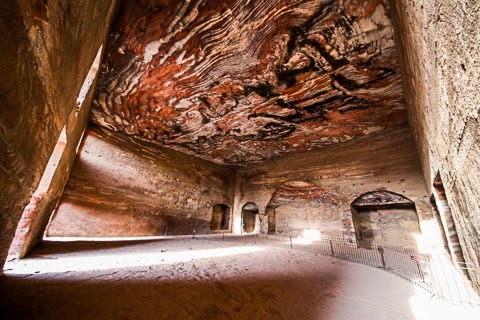 Once inside, nothing prepares me for the raw beauty of its rocks or the roughly eroded Greco-Roman architectural motifs in rainbow sandstone. The tombs are empty, of course, but very dramatic in the late-afternoon light. 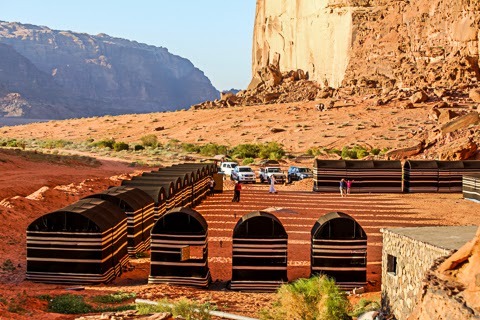 The Bedouin Lifestyle Camp, laid out against a protective cliff face, deep in the Wadi Rum desert. At the Bedouin Lifestyle Camp, everyone applauds to see our dinner clean, cooked and intact. 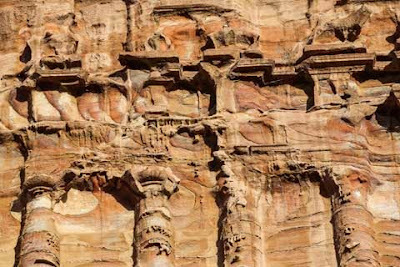 Detail of Hellenistic architecture that looks very contemporary, thanks to centuries of erosion.